Bearing in mind, I got some answers that I’m not sure I’ll ever get good enough to go through (the original Doom on Nightmare? We’ll see. ), but I got some good ones, too. One came from a good friend of mine, and since it’s one of my favorite games on the NES for a while, I decided to take him up on it. 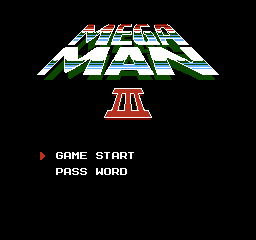 So here it is: Mega Man 3. Now, as this is the first Mega Man game I have ever reviewed here and I’m all about game education, I’ll tell you a little bit about the series. Essentially, there are two scientists, Dr. Light and Dr. Wily, who make robots in the future. Dr. Light, as his name would imply, makes them for the good of mankind. Dr. Wily- well, his name also implies his intentions. As Mega Man, the title character and prize project of Dr. Light, you have to stop Dr. Wily’s robots from wreaking havoc all over the world. Each entry tends to revolve around this basic premise, and the third installment is no exception. In this entry, Dr. Wily, supposedly reformed from his evil ways, joins Dr. Light to bring a peace bringing robot called ‘Gamma’ to the world. As no surprise to anyone, another group of robots has gone rogue, and it’s up to Mega Man to solve the mystery behind it. Now, it’s going to be kind of strange to not review this series in order, so bear with me. Also, bear in mind that there were two entries before this so I might mention so improvements that simply haven’t been gone over here. I definitely suggest playing through the first two before this one to fully appreciate the improvements that have transpired. As far as the basic mechanics go that make the game so great, they have transpired over the past three entries. When you go through a robot master’s level, themed to fit their particular flavor, you face off against them. When you defeat them, you get their power for use in later levels. Even better, there’s a certain weakness that each robot master has, so if you use that against them, it makes the bosses much easier. In fact, in this iteration, it’s almost a requirement. There’s very little in the way of mechanics here aside from jumping, shooting, and dodging. In this entry, there’s another move added to Mega Man’s ensemble. By holding down and jumping, he can now power slide. This is not just an interesting addition because of gameplay variety, but it also serves as the only way that our hero can duck under obstacles. As you travel through levels, you can find items called ‘E’ tanks. These tanks act as the robot powers do. When you’re running low on energy, you can use them to fill your life. If you take your time, you can find a plethora of these incredibly helpful objects, and they do become integral in the later levels. Let’s be honest. Mega Ma, as a series, pretty much coined the phrase ‘Nintendo Hard’. The game is a lot of fun. It’s the typical formula of learning the patterns of the enemy, learn the patterns of the boss, and feeling completely satisfied when you finally beat the level after your fifth try. The difficulty in this game, however, is described by almost every Nintendo fan as ‘steep’. The first two games in the series were not picnics. This game, though, sets the bar on a whole new rung. There are a lot of instant deaths. There are a lot of deaths from getting knocked into pits. If you’re someone who isn’t up for a challenge, this is definitely not the game for you. The catharsis of getting through the needles, the pits, and the cheap shots is like the nectar that sp,e gamers live off of. If the catharsis is the nectar, though, then the music is the candy that sates you until then. 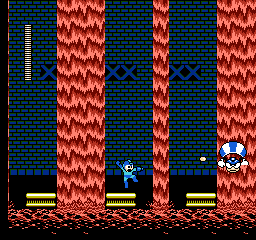 The Mega Man series, at least in the 8-bit days, was known for its electric deep beats and fun tinny melodies, and this game is no different. Every theme brings a different feel to each of the levels, and the fact that they’re catchy doesn’t hurt. Personal favorites include Gemini Man’s level and Top Man’s level. Finding an all around favorite, though, is like picking a favorite Ninja Turtle: no two people tend to agree. Honestly, I think that’s what makes the soundtrack so great. The fact that there are so many good tracks that it’s difficult for two people to lean toward the same one. The sound effects are what they are. They’re electronic representations of electronic things, so they’re spot on. The front end is almost identical to the other games in the series. It’s clean, crisp, and somewhat colorful. For its time, it was definitely a forerunner in the graphical department. As a standalone, the backgrounds, the enemies, the creative characters- they all look great. Compared to the rest of the series, it’s even a step up. You know, I went into this set on normalizing the graphics of this game. Instead, I’m just sitting here and praising them. I guess that speaks something of them on its own. The main downside to this game is that the difficulty that makes it so interesting is also its biggest flaw. The checkpoints are pretty few and far between, especially in the fi nal stretches. When you make it through the whole level, hit a mid-boss, and get sent back to the beginning of the entire level, it takes a lot of wind out of your sails. I’m sure that there were probably a lot of broken systems and cartridges in 1990. To get through this game, you really need to either be sincerely gamer savvy or a sadist. Having a niche because of topic is one thing. Carving a niche because you’re difficult? It’s not unheard of, but you alienate and frustrate a lot of people. Well, buckle up. It’s a great and treacherous ride. It’s always a re-education every time I go back and play one of these games. I beat both 1 and 2 back in the day, but I always forget how difficult these games actually were. I play them now and ask myself how I ever made it through. I definitely hear you. I love the games, and I replayed through a number of them over time, but every time I do, it’s like I forget how game physics work. Never mind how tough they are anyway. Plus side, it always feels rewarding when you progress!